Germany has reported 4,621 SACs and 738 SPAs to the EU (state 2011). Altogether they are comprising more than 15 % of the terrestrial surface of Germany and about 45 % of the marine area. 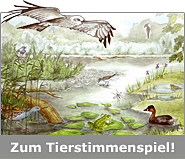 Baden-Würtemberg holds 350 Natura 2000 areas covering more than 17 % of the terrestrial site. You can see their accurate location using the map service of the LUBW. You can also find out if your next holiday destination is close to a Natura 2000 site using the Natura viewer of the EU. The protection sites are reported all over Europe on the base of the Habitats Directive and the Wild Birds Directive of the EU independent from their present land-use. The land-use can be continued on the reported sites as long as it doesn’t significantly damage the protected species and sites. Identification and mapping of species and habitats which have to be protected according to the directives. Suggestion and definition of preservation and development aims and measures. Information and participation of land owners and land users and the interested public, e.g. in the context of information events. The management plan for the SAC “Rhine valley between Wintersdorf and Karlsruhe” is presently being developed. Experts already have identified the habitats of species such as the great crested newt, certain fish species and the rare molinia wetlands. Further information on the management plan you find here.